This is an update to our former forecast 'The Stock Market of Russia - Collapse is imminent' published 3rd of April 2014. It was a bold forecast, let us take a look at how it played itself out so far. 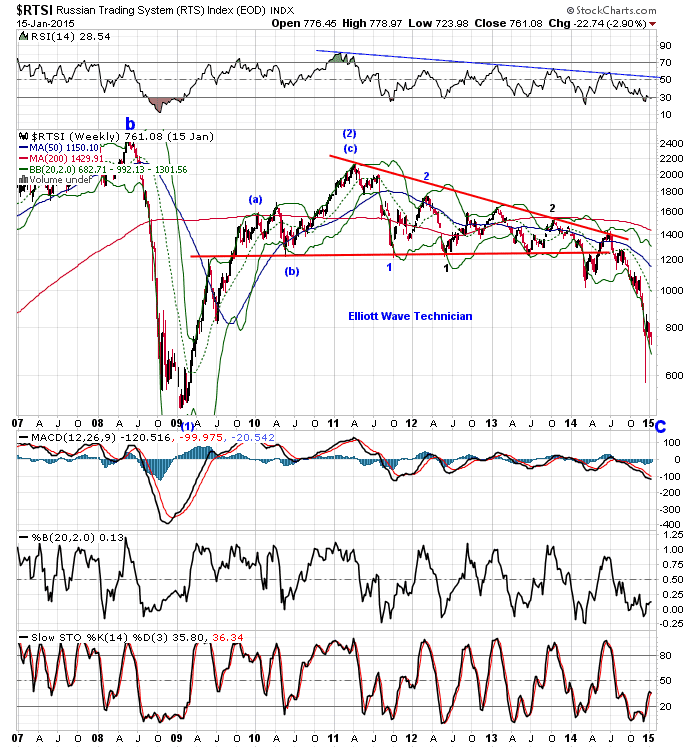 Here is an updated chart of the RTSI Index which represent the Russian Stock Market in USD. "(2)" rally topped early 2011, since then the Russian stockmarket has displayed a number of "1" and "2" waves of different degrees of trend. Currently a small rally up to the horizontal resistance line marked in red color on the chart is topping. The next should be a devasting decline in wave "3" of "3", most likely with large price gaps as the stock market of Russia collapse. The implication of increasing negative social mood will be terrible, expect a more agresive and assertive Russian government, the current conflicts will escalate, chaos, destruction and further economic deterioration will follow. The economic deterioration will soon hit the core European countries like France and Germany with full force." Our forecast is playing itself out well so far and is unchanged. We expect the decline to continue in the Russian stock market priced in USD, as well as further deterioration in the core European countries like France, Italy and Germany.